Engineers and crane manufacturers have significantly improved overhead cranes—structurally and mechanically—over multiple decades. While these improvements have made material handling easier, more productive, and ergonomic, it’s the control technology that has truly revolutionized safety and ease of use. Control systems are an essential part of an overhead crane or hoist because they allow the crane operator to control the system from any location, in a safe, efficient manner. To dissipate energy, most older cranes require contractors to switch regenerative load currents to resistor banks. This type of setup requires costly part replacements and expensive labor costs, making it inefficient, terribly expensive, and unsafe. Not to mention, older cranes with early electronic controls include parts that are difficult to find, let alone replace. Although there are several control technology options available, AC power with inexpensive, effective ac-motors and Variable Frequency Drives are perhaps the best option available today. One way to switch from outdated DC cranes to modern, safe, and effective controls is to convert cranes to operate on AC power with ac-motors and Variable Frequency Drives (VFD’s). VFD’s have transformed the industry for supercharged AC crane controls, even exceeding the torque control and speed regulation abilities of DC shunt motor control. In fact, AC VFD’s provide enhanced performance and safety, and improve production by prolonging the life of the equipment, reducing maintenance costs, and allowing crane operators to do their job safely and effectively. Safety is built into modern VFD’s, including features that prevent operators from lifting loads over capacity, minimize load swing, prevent motor overheating, and limit unsafe programming modifications. They minimize the shock effect on the crane and the load by reducing high starting currents characteristic of AC induction motors. They provide the crane or hoist operator with a variety of operating modes (single, two, three, five, or even unlimited variable speeds) and options. They open the door for added technology, which is—believe it or not—simple and inexpensive. These application-specific software options can be added to most VFD’s to meet unique application requirements and enhance safety, ease of use, and performance. 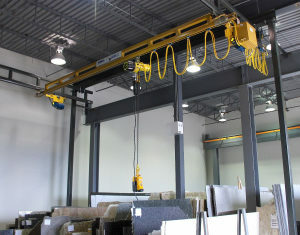 HOW CAN LOAD CONTROLS & PENDANT STATION IMPROVE YOUR OVERHEAD CRANE SYSTEM? Overhead cranes are usually controlled from the shop or factory floor, which can sometimes lead to dangerous incidents, particularly in heavy-duty applications where workers need to manually control the crane on catwalks or over boiling metal, etc. Remote controls allow operators to control the crane from the floor at mostly any point in their shop, making their job easier, most productive, and much safer. Pendant pushbutton stations are also a great alternative because they allow the operator to control the crane without the need for a second “signal” person to direct the load. Overall, radio remote controls and independent traveling pushbutton pendants allow for a better view, while keeping the operator away from the load and any associated danger. For overhead cranes in most manufacturing industries, crane travel is in fact directed by one operator, either manually or with a pendant station or wireless control. Using these types of motorized controls allow operators to guide their electronic or pneumatic-powered travel and multi-directional movement of materials to support manufacturing, storage, loading/unloading activities in or outdoors for mostly any application.